DataNet Quality Systems Knowledgebase :: How do I read the Goodness of Fit tab and Distribution Analysis tab in the Variable Analyzer? How do I read the Goodness of Fit tab and Distribution Analysis tab in the Variable Analyzer? 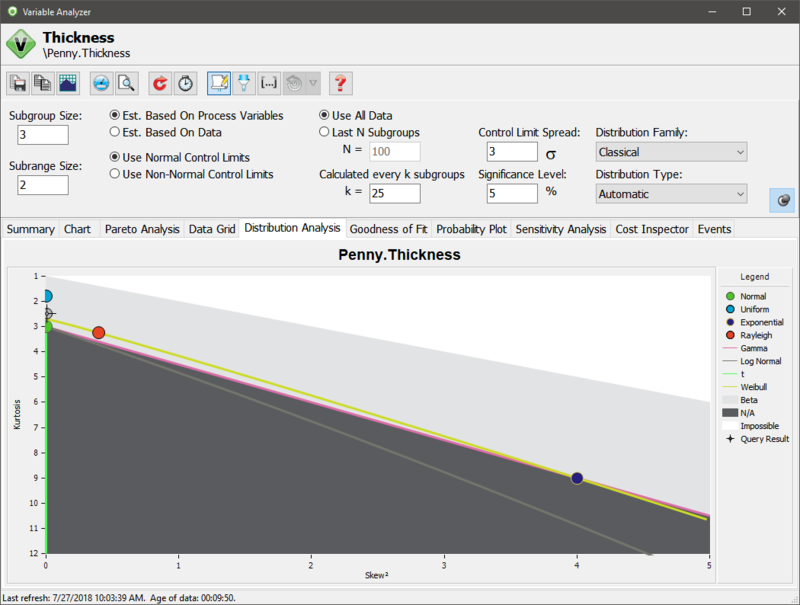 The Goodness of Fit tab within the Variable Analyzer compares a Variable’s data distribution with industry-standard theoretical distributions. The information in this tab is sensitive to values entered in the Calculation Settings panel at the top of the Variable Analyzer. Distribution Type – lists industry-standard distribution types, ordered by how well they fit the variable’s distribution. Fit Tightness – classifies how tightly a distribution in the Distribution Type column fits the variable distribution. The four categories of fit tightness are Excellent, Good, Fair, and Poor. # Parameters – lists the number of parameters (2, 3, or 4) used in WinSPC’s comparison of the variable’s distribution to each industry-standard distribution type. The number 2 indicates that the μ and s parameters were used. The number 3 indicates that the μ, s, and either skew or kurtosis parameters were used. The number 4 indicates that the μ, s, skew, and kurtosis parameters were used. All other factors being equal, if more than one distribution type in the Distribution Type column has the same category in the Fit Tightness column, the lower the number in this # Parameters column, the higher the distribution type will be ranked. 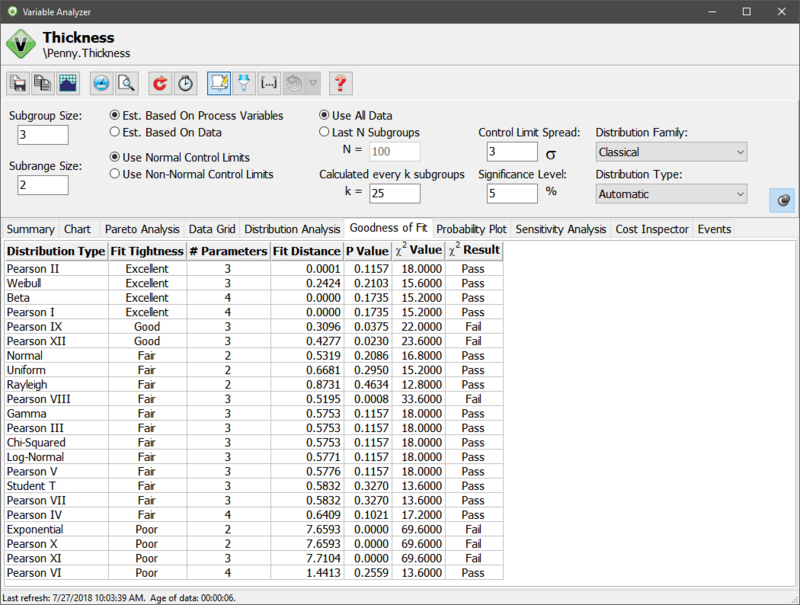 Fit Distance – further clarifies the fit of a standard distribution type to the variable’s actual data. The lower the value, the tighter the fit, with a zero in this column indicating an exact fit. P Value – indicates how well the current variable’s actual data follows the distribution listed in the Distribution Type column. P Values range from 0- 1, where a value of 1 indicates an exact fit. The higher the P Value, the tighter the fit. A lower c² value results in a higher P value. c² Value – a measure of error between the current variable’s actual data and the distribution listed in the Distribution Type column. The lower the c² value, the tighter the fit. A higher P value results in a lower c² value. c² Result – the result—Pass or Fail—of a c² Goodness of Fit test which checks whether the P Value is greater than the Significance Level value, entered in the Calculation Settings panel. If the P-value is greater than the Significance Level, then Pass is marked in this column and the variable’s actual data is determined to fit the standard distribution to which it is compared based on the c² Goodness of Fit test. If the P-value is less than the Significance Level, Fail is marked, and the variable’s actual data is determined not to fit the standard distribution to which it is compared based on the c² Goodness of Fit test. How are Variable Analyzer's visualizations related to Data Collection's visualizations and Variable Setup? How do I set a default Chart Scheme for the Variable Analyzer, Attribute Analyzer, Dashboards and Reports for a User or User Group? How do I set the default number of subgroups visible in a chart? How can I change the X-axis scaling on a histogram chart? Post Comment for "How do I read the Goodness of Fit tab and Distribution Analysis tab in the Variable Analyzer?"